Marijuana farming is a big business, and marijuana growers are raking in billions. In California, the crop ranks between lettuce and grapes; total sales in the state, according the Los Angeles Times, will top $21 billion by 2021. In Colorado, where marijuana is also legal, revenues stood at just over $1 billion last year, adding $2.4 billion to the state’s economy. Those numbers are for legal farms. 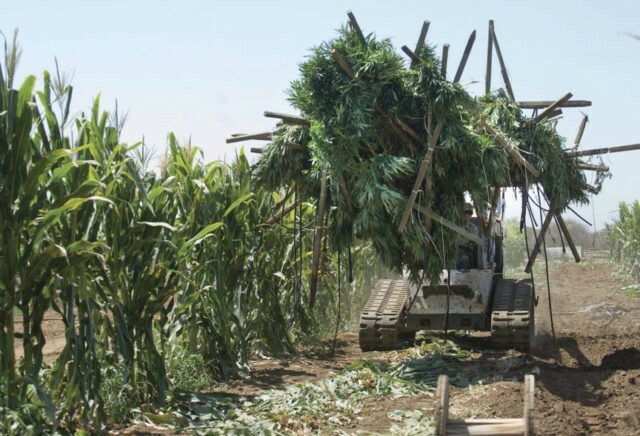 Illegal marijuana cultivation is much larger. It is estimated that there may be as many as ten million illegal plants grown annually, yielding over $30 billion worth of product. In California, illegal pot is being grown on literally thousands of acres of the state’s national and state forests and parks, including in Stanislaus National Forest adjacent to Yosemite National Park. A one acre illegal patch can produce well over $1 million worth of marijuana per year. Much of the illegal harvest is sold in states where marijuana remains illegal – but where there is also huge demand, jacking up prices. Commerce in illegal marijuana is often controlled by the same Mexican drug lords who sell cocaine, heroin and contraband opioids; to make things worse, their illegal plots are often tended by illegal immigrants who are virtual slaves, guarded by thugs with high-powered weapons. Pot production may rake in billions of dollars, but at immense environmental cost. Research has documented that marijuana cultivation, legal and illegal, is polluting water, land and air at an alarming rate. Both legal and illegal growers use large amounts of pesticides, insecticides and other chemicals and fertilizers banned in the U.S., illegally divert streams, and discharge polluted waste into waterways, poisoning the water supply, fish and animals. Growers have also clear cut trees and excavated forests illegally creating vast wastelands. When they move on to another illegal site, the old one is often the equivalent of a toxic waste site, saturated with poisons and fertilizers. Despite evidence of significant criminal toxic waste discharge and other environmental crimes, not surprisingly the Obama Justice Department largely ignored the problem. In the liberal mindset, marijuana, unlike coal, oil and gas, is sacred stuff and considered outside the reach of the law. And there is little noise from the environmental movement which, if oil and gas or timber were the product, would be all over the issue like a wet blanket. But not marijuana. A good example of the problems is Calaveras County made famous by Mark Twain, in the foothills of California’s Sierra Mountains. About the size of Rhode Island, it has a population of some 44,000 people. The County Board recently voted to ban commercial marijuana production – a prerogative under California’s law legalizing it. Their sheriff estimates there are at least 1200 illegal farms scattered through the mountainous terrain, all discharging large quantities of chemical waste into the water supply (nearly 10% of California’s water originates in little Calaveras County) and fouling the surrounding land with illegal herbicides, insecticides and rodenticides. Cleaning up those sites – just in Calaveras County — will cost, according to U.S. Forest Service estimates, at least $240 million; perhaps much more. Expand Calaveras’s problems across 15 other Northern California counties and the problem becomes almost unimaginable. Environmental groups such as the Sierra Club and the Natural Resources Defense Council are nowhere to be found. Ironically it was these very mountains where Sierra Club founder John Muir hiked and studied for decades. I spoke with Dennis Mills, a member of the Calaveras County Board of Supervisors, who told me he has begged local and national environmentalist groups to get involved, but his pleas are always met, he said, with a yawn. Mills documented the abuses in a study Cultivating Disaster conducted by The Communications Institute. So where is the federal government? Illegal and many legal marijuana farmers are likely in flagrant violation of numerous federal environmental criminal laws ranging from pollution crimes, wildlife and animal welfare crimes, and could be subject to large fines and restitution as well as lengthy prison sentences. The Environmental Protection Agency, the Interior Department and Agriculture Department all have jurisdiction, and the Justice Department, complete with an Environmental Crimes Unit, together with California’s U.S. Attorneys, should be actively investigating these crimes, empaneling grand juries, and issuing indictments against these criminals. The Trump Administration would do well to unleash its environmental lawyers on this nasty problem. It would greatly assist local and state agencies in dealing with the serious environmental mess caused by pot cultivation. It might not gain much support from marijuana users, but an aggressive campaign would undoubtedly create plenty of good will among the rest of the population and deal with a serious environmental problem. Mr. Regnery, an Attorney, served in the Reagan Justice Department. He is Chairman of the Law Enforcement Legal Defense Fund.